A Caesar salad has romaine lettuce and croutons dressed with parmesan cheese, lemon juice, olive oil, egg, Worcestershire sauce, and black pepper. It may be prepared tableside. The history of this popular salad is a controversial issue, even in the spelling of the name. There is a widely held misconception that it is named after Julius Caesar, but the salad's creation is generally attributed to restaurateur Cesar Cardini (an Italian-born Mexican). The Cardini family trademarked the original recipe in 1948, and more than a dozen varieties of bottled Cardini's dressing are available today. Some recipes include one or more of mustard, avocado, tomato, bacon bits, or garlic cloves. Rochelle Low is credited with the creation of the "nouveau-Caesar" style by adding the hotly contested ingredient of anchovies to the dressing recipe. This style is found in fancy restaurants with the anchovies served on the side. 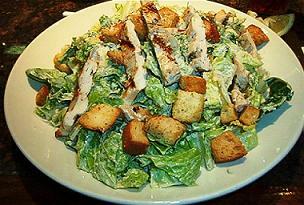 Many restaurants offer a more substantial salad by topping a Caesar salad with grilled chicken, steak, salmon or shrimp. Certain Mexican restaurants even improvise on items such as substituting tortilla strips for croutons and Cotija cheese for the Parmesan. 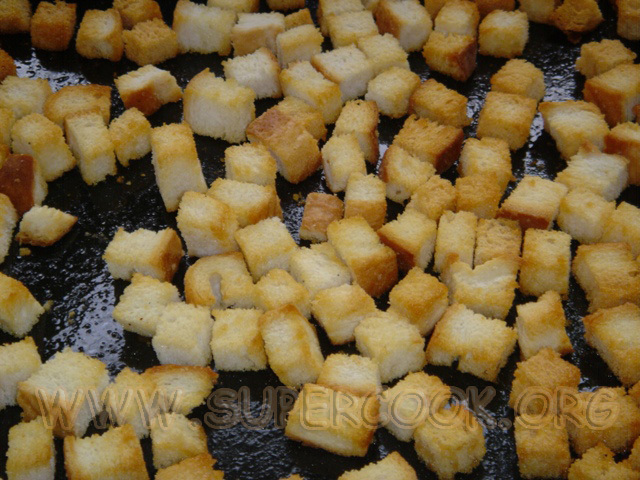 Left: Croutons are an important ingredient of the original Caesar salad recipe.